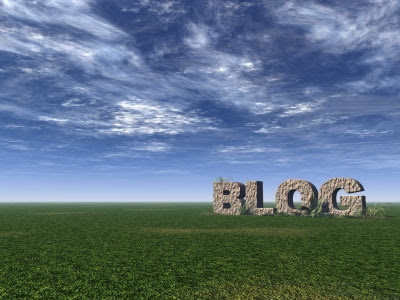 Blogs seem to be a new thing. Everyone seems, NOW, to know what they are. But in fact they have been around for quite some time. They are great if you are the blogmaster, it's a way to tell a story, and have the ability to use a specific word to zoom the person who is reading to another place to "show" them exactly what you are talking about. I SO wish when I talked and said certain words, it could take my listener to another place to see what I mean! How cool would that be! I learned about them about 4 years ago! I wanted to learn French, so I googled - how to learn french, I found a site that said it would teach me one french word a day, I went there, signed up for the email that promised me, one french word a day and started getting emails from 'French word a day'. I read them everyday, and couldn't really figure it out, I mean I just assumed that it was in fact a company or corporation who delivered this email, but it seemed personal. Because I received them by email format, it looked just like text, until one day, I had clicked the highlighted link on the bottom and it took me here! Then I thought, oh my, this is an actual person, how cool is that!? It was a woman, Kristin (we've emailed back and forth, so I feel like I actually know her, in some virtual way:) who had 2 kids and was married to a french man, she was a desert rat and moved to France quite some time ago, she wrote about her life there and everyday would have a new adventure! Quite awesome, given that I am naturally a very curious (or nosey) person, this was my cup of tea! I read every day and at that point, had still not ever heard of the word blog! She did not label it that way, so I'm not sure exactly what I thought I was reading. One day, she wrote a post about her friend, who was also American and living there and how she had dared her friend Corey to start a blog. When I read this, I had to stop reading and had this "ah hah!" moment...I had been reading a blog and didn't know it. With the link embedded on this new persons name, I clicked it and zooomed to her birthing of her blog, a blog to which I still read weekly!! From Corey's blog, (who also has a handsome french husband, I think some people may read just to see photos of him;) I followed links and found other blogs, there was this one, that one, and these two! Have I mentioned that 3 of those blogs actually had books published?? Real books too! So now I have a blog for my business! It's great fun! And I have friends who have blogs! There is Shelly at Drooz doodles, Laure Lille the photographer, Laura Ponticello from Laura's List, Susan Major with her inspirational blog, Thea Folls and her flower farm, Aurora and her hairapy blog across the country, Charity, a local girl and her interior design blog, Skaneateles even has its own blog - written by the Briel family, Dina the cake lady and her blog, and Skaneateles suites has one too! Okay so you get the idea...almost everyone has gotten a blog:) It's fun, it's easy and you too can do it! If anyone would like to know how to do one, it's great for families to keep in touch, and rather than repeating something to everyone, if you are far away or abroad...just blog it. Stop in and see me, I'd be happy to show you how to set one up, it takes a second and believe me, it's as easy as 1-2-3! Thanks for the include. Stopped in the shop looks amazing! Loved all the fun stuff you have. I need to get some time and make appointments for all your new treatments.